You may catch this type of taxi at a taxi stand or flag one down in the street. If the taxi is vacant, you will find a "Vacant" or "For Hire" sign in red color and the lamp of the taxi sign on top will be turned on. The basic fare is 3,300 won per 2km and then additional charges are added depending on the distance and time covered. From midnight, a late hour premium will also be charged. This type of taxi is black and has a yellow taxi sign on top. A free car phone service is provided and you may use your credit card for payment. Deluxe taxis can be easily found at airports, hotels, and tourist attractions where many foreigners visit. 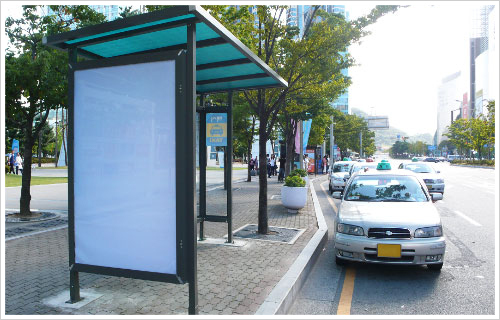 The basic fare is 5,000 won per 3km and additional charges will be imposed depending on the distance and time covered. According to distance and riding time, general taxis charges 100 won and deluxe taxis 200 won more. 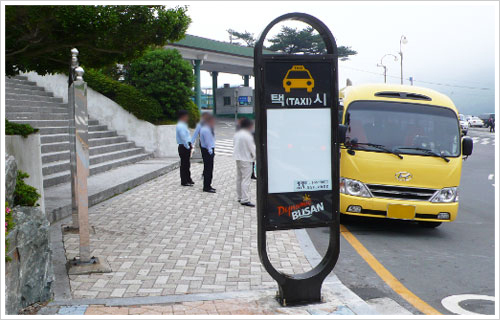 In Busan, there are two Brand Taxis: Deungdae Call, which are private taxis; and Busan Call, which are company taxis. Both of them provide the Call Taxi Service, whereby you can make a telephone call when you need a taxi, and the taxi will come topick you up and take you to your destination. However, if you just happen to catch this type of taxi on the street, you can ride it in the same way as any general taxi. Payment by credit card and cash receipt issuance machines are installed on board. You can recognize the Deungdae Call taxis by their orange "sign lamp" and "band". Those who wish to ride the taxi are asked to call the Call Center (☎ 600-1000) and a taxi will arrive in 3 to 5 minutes (this CDMA type service was first introduced by Deungdae Call). The taxi fare is the same as that of any medium-sized taxi (General Taxi). An interpretation service (in English, Chinese, Japanese, and Russian) is available. You can recognize the Busan Call taxis by their light blue "sign lamp" and "band." The taxis are equipped with a GPS Call Terminal. Taxis run 24 hours a day on a "two drivers, one vehicle system." The taxi fare is the same as that of any medium-sized taxi (General Taxi). The Jumbo taxi is black, with a yellow taxi sign on top. It is a large passenger vehicle and can accommodate as many as 5 to 10 passengers. When there are lots of passengers or baggage, this type of taxi will be more convenient for your group.